Google does it again - The story of AB Publish - From Start to end! I have just spent the evening helping one of AB Publish's clients. We searched around on the internet and we discovered Google Image Charts (or Google Chart API). The purpose of this free utility is to dynamically generate charts via an http request. To put it simply, an address typed into your browser will generate an image of the data which you pass as parameters. Every programming language guidebook always starts with the infamous "Hello World" algorithm. The aim is to display the words "Hello World" on the screen, printer, DVD or whatever output you are using. Google Image Charts is no different and one way of visualising the power of what is offered is by the Hello World example (see the result on the right if you are unable to follow the link). I was amazed - the address I had typed into the browser displayed a perfect pie-chart! With only 4 parameters passed to an address somewhere at google.com, an image is shown. Ok, but can I change things? Google have made everything very easy with their Google Image Charts. 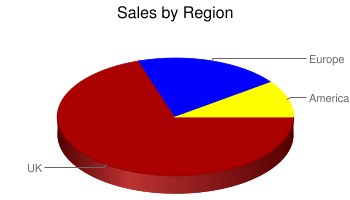 The percentages for the two segments 'Hello' and 'World' have been changed from 60:40 to 10:90, which is instantly reflected in the rendered chart. Ok, but the 3D effect is a little old-hat and I want something clean and crisp...in that case change the chart type value (CHT) in the address from 'p3' to 'p' for a simple pie-chart. Ok, but this time I want to change the headings to something more meaningful for my Business Website and although I finally prefer the 3D effect I want something bigger, and the colours do not match my Business Internet Colours so they need to change, and I want a title...in that case, change the chart legends (CHL) to whatever the headings you wish to display; change the chart type (CHT) back to 'p3' for a 3D pie-chart, change the chart size (CHS) to whatever value you wish and add new parameters for the chart colours (CHCO) and the chart title (CHTT). The actual start of all this activity this evening was to find a way to represent the daily ticket sales for a theatre piece. I had to show 6 nights performances for which there were between 348 and 622 ticket sales to display. These can both be seen in the real life example of Red Devil Statistics where I saved the resulting images from Google, added a border and then uploaded the images using the easiest Internet Creation system around, the AB Publish Internet Site.